and tried the ride side of the wallpaper abit moreee darker..
Oh my gosh Syahirah your the most sweetest person ever..*runs and tackles you in a hug*. Oh my gosh and you choose my most favorite scan of lelouch in his emperor outfit...I spent like forever one day just staring at the scan thinking I hope someone makes a really good wall of this..and what happens YOU MAKE THE MOST AWESOME WALL OF IT WITH LELOUCH EMPEROR OUTFIT HOTTNESS. I love the background it so goes with him and the art style and it makes it just dramatic enough and I love the textures and the colors..lol and thats what you meant by orange and purple..lol I was so confused earlier..hehe you sneaky thing I didnt see this one coming ill have to surprise shock you with your hubby grell..*evil grins*..lol Thank you so so much your the best..*hugs so much*. AND YAY IM THE FIRST TO COMMENT because Im your number one fan..*smiles*. My memory has gone blank and suddenly I found myself kneeling on the floor and waving my arms in a dramatic fashion while screaming "All Hail Lelouch" for 4 minutes. Who doesn't love Lelouch in his emperor clothing? ^_^ Very beautiful wallpaper! great! it's simple but looks good! ^^ I like the texture u used^^ thanks for sharing! There's a little extraction problem at his right finger, but except that, great job. Good colors, I like the texture and the lighting. His cape seems empty though, maybe you should have added text on it with a fancy stamp underneath. Well, enough nitpicking XD It's really beautiful. An excellent wallpaper of my all time favorite character. The texture is great, and the colors match him perfectly. I have to say it. 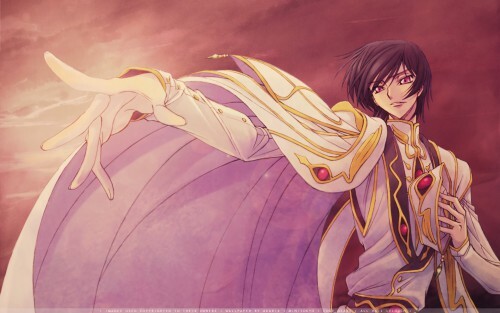 I said it when he was crowned and when he appeared to die so i have say it here ..."ALL HAIL EMPEROR LELOUCH!" Excellent wallpaper...I love Lelouch...this will be my background for a while.Thank you.All Hail Lelouch! I love Lelouch! Lelouch the best! C?????????. ??? ?????????! ? ????? ????? ?, ?? ??? ?????. ?????? ?????????????. ???? ???? ??????????? Me want, me want! ?_?